in-tank system that pumps, filters, agitates, and treats electroplating, anodizing, printed circuit, low-sludging iron phosphate, and allied metal-finishing solutions. • Agitation as a natural byproduct of filtration. This feature is frequently sufficient to replace air or mechanical agitation systems. • Ease of filter cartridge changes, without the need for tools or production interruptions. • In-tank carbon treatment for the removal of organic impurities, such as brightener breakdown products. 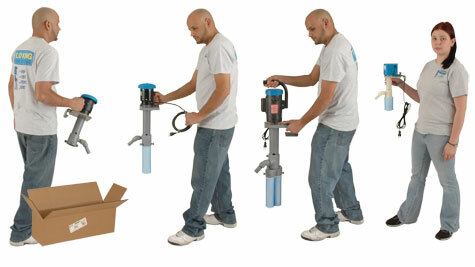 • Versatility ... can be used stationary in one tank or moved from tank to tank as a utility pump. 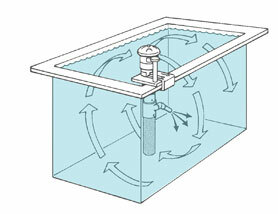 • Less costly than out-of-tank filter systems. • Several models for small and large tanks alike—production, prototype, and lab. • CPVC, polypropylene, PVDF (Kynar), and stainless steel available as pump materials of construction. • Can be used with our novel blanket-like reusable filter cartridges, or with disposables. It's your choice. • Fast, easy installation. Out of the box and into the tank! Just plug it in. remove particulates, carbon treatment devices to remove organic impurities, and accesssories to promote solution cleanliness and waste minimization. Flo King systems are used to filter decorative and functional plating solutions, including brass, bronze, cyanide cadmium, trivalent and hexavalent chromium, hard chrome, acid copper, cyanide copper, electroless copper, electroless nickel, acid gold, cyanide gold, bright nickel, nickel chloride, nickel sulfamate, silver cyanide, tin, acid chloride zinc, alkaline non-cyanide zinc, and cyanide zinc. Other applications include acid pickling, anodizing, blackening, cleaning, chromating, post-anodize dye and sealing, electro-forming, electropolishing, passivating, and zincating. 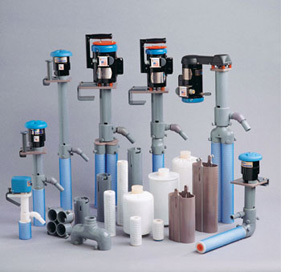 in-tank pumps and filter systems for the metal- finishing industry for over 30 years. Our customers include jobshops, manufacturers and laboratories. Many Flo King products are available to ship to you in a day or two from our factory in central Florida, USA.